Listen to WILD TIME host Thomas Janak speaking to animal rights activist Keith Mann about animal rights activism now and then, his time in prison and his new book: "From Dusk Til Dawn"
New footage uploaded: Animal abuse in Egypt! Listen to Thomas Janak in conversation with animal rights activist Ahmed Diab, who hails from Egypt! What a brilliant day I had!!! - I so enjoyed the conversations with Lyn Genders, Carolyn Scott, Keith Mann and Ahmed Diab. The footage will be aired in 2010 or even earlier. 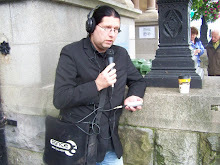 The interview with Ahmed about the almost non-existing animal welfare in Egypt will be edited today and published on Indymedia.ie - the link will be announced here soon! WILD TIME returns to the airwaves on November 20th 2009 - check out the blog for current activities!